And so the Grand National, that most reliable sporting source of the improbable and romantic, delivers a sparkly-eyed saga once again. At 25-1, Pineau De Re was an unlikely story from a simple statistical perspective. But that tells little of a three-way tale entirely in keeping with the rich traditions of this special Saturday in spring. There is the jockey, retired a few years ago after the game seemed up. There is the trainer, a part-timer with a career as a family doctor and a stable of just 12 horses. And there is his pal of 25 years, the owner, who bought the horse with a Grand National in mind - the Midlands Grand National, not so much the little brother of this 175-year-old Aintree giant as the distant cousin spotted occasionally at family weddings. For jockey Leighton Aspell this was a day that had long seemed impossible. He had enjoyed a fine debut in the race 11 years ago, finishing second on Supreme Glory. But by 2007 the rides and fun had dried up, and his time seemed spent. "I had a bad month or two, and I got a bit low," he admitted on Saturday evening. "I wasn't enjoying it anymore." Taking a job with Flat trainer John Dunlop in Arundel, his successes came against a different sort of runner on the local athletics scene. Much as wins in off-road races like the Fizzleworth Flyers 5 and Roundhill Romp kept his long frame lean, they did little to replace the adrenalised thrill of jump racing and the camaraderie of the weighing room. "Within 12 months I realised I had unfinished business," he said, yet it would take a tip and a wink from fate to get him here. Had Sam Twiston-Davies not opted to ride Tidal Bay in the National after Cheltenham, the itch would have remained unscratched into Aspell's 38th weary year. Instead he found himself, after a scrape or two on the first circuit, with daylight from the Canal Turn second time around. With the big names and well backed going down early or tying up in his slipstream, he was alone and daring to dream with two fences to go. "I just took aim at the middle of the last, and that was my route home," he said, champagne flutes and bottles of beer all around him and the sounds of whooping and rich applause still bouncing off the walls. That would be a narrative enough for many sporting events. For this it was only a strand in the implausible plot. Alongside Aspell, happier to sooth his hoarse throat with a little of the sponsor's tipple, trainer Richard Newland had the pink cheeks and wide eyes of a man yet to come to terms with what he had just witnessed. For most of his professional life he has been a GP in Birmingham. Only in the past year has he stopped attending surgery. Only in 2006 did he first take out a trainer's licence; even now he has just a dozen horses in his stables in Claines, a few miles north of Worcester, and a staff of just five. Never before had he entered a horse in the Grand National. For a quarter of a century he has been coming to Aintree with John Provan, but only in May last year did they opt to take Pineau De Re in Doncaster's May Sales. For the giddy owner, what the doctor ordered was not initially what he wanted. While the pair had owned horses together before - they had first bonded over a love of racing after moving to the same village - Provan feared the 11-year-old might be a little long in the tooth. What did he have left to give? "I'd usually go for a five- or six-year-old with a bit of a future," he said. "I saw this as a window of opportunity. I thought maybe we could win a Midlands National. "We love taking on the big guys. But we could only dream of winning the National." After triumphing in the first £1million purse running of the race, you might expect the good doctor and his old pal to stretch their legs a little. Instead, the prescription is a simple one: more of the same. "I'm not intending to change because I really enjoy it," said Newland on being asked whether he would expand his stable. "It's great fun but it's not my primary source of income. If you change the balance, some of the enjoyment may go out of it. This is a hobby for me." On a grey, soggy afternoon turned once again into a Merseyside version of the Rio Carnival by the 70,000-strong capacity crowd - tanning salons in town will be drinking champagne until Christmas - there was delight in the safe passage of all 39 eventual runners and riders around the thankfully softened old fences. Elsewhere, there were necessarily broken hearts mixed in with the torn-up betting slips and discarded pint pots. In second, the hardest spot of all in which to land, Richard Johnson on Balthazar King could have been forgiven for cursing the same fates that had blessed the lucky three of Aspell, Newland and Provan. 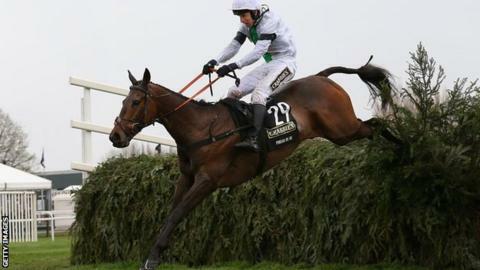 This was Johnson's 18th unsuccessful race, an unwanted record for the man who has had to settle for second behind AP McCoy as champion jockey 13 times. That he bettered McCoy by a place on Saturday afternoon will come as little consolation. With four more disappointments to add to the 35 he has endured since 1980, exceptional trainer Nicky Henderson's own curious blind spot remains untreated. Neither was there a happy ending for joint favourite Teaforthree - unseated at the 15th - or Sam Waley-Cohen on Long Run, too eager after the two false starts, too close to the ninth to get over it. But that is the National, as disrespectful of reputations and predictions as it is constant in converting flimsy dreams to far-fetched reality.